So many of us procrastinate, and often we carry shame or embarrassment about it. But the truth is that if you remove yourself from the negative perception of procrastination, you can discover the opportunity for growth that lies within this struggle. By remembering your purpose and re-evaluating your task, you can actually find a better way to do it—or you may find that you don’t need to be doing it at all. In this episode, I’ll discuss why we procrastinate and share what you can do to get yourself into a confident and productive place. You will learn the role that fear, negativity, confusion, and anxiety play in procrastination, as well as how to move past these stumbling blocks and start achieving your goals. How examining our procrastination can tell us what we need to work on. What’s really fueling your procrastination and how to work past it. How procrastinating blocks you off from the purpose of the work and more. What to do when you notice you’re procrastinating. The opportunity for growth that lies within procrastination. Why discovering the ‘big payoff’ of a task can help put things in perspective. What procrastination can tell you about your priorities. Advice for moving past procrastination. 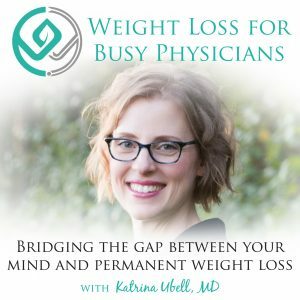 Katrina Ubell: You are listening to the Weight Loss for Busy Physicians podcast with Katrina Ubell, episode #106. 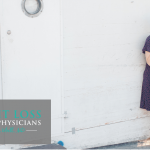 Welcome to Weight Loss for Busy Physicians the podcast where busy doctors like you get the practical solutions and support you need to permanently lose the weight so you can feel better and have the life you want. If you’re looking to overcome your stress eating and exhaustion and move into freedom around food you’re in the right place. Hey friend, welcome back to the podcast excited to have you here. Hope you’re having a great week so far, and hopefully you’re settling into the new year. For those of you who joined my new group we are one day in, I’m so excited to have you here. So excited, we’re going to kill it over the next six months, it’s going to be amazing. I have a really, really great topic for you guys today. It was really interesting because I was wanted to know more about this topic and I was researching other podcasts and just other information on this topic and I could not find very much. And I thought, “That’s so telling, that’s so fascinating.” And so, I can’t wait to be someone to be able to bring this to you today. So, we’re going to talk about procrastination, and a new way of thinking about it I learned from Dan Sullivan, if you are interested Dan actually has a podcast called The Joy of Procrastination, believe it or not, which I think is the best title. 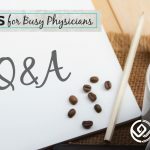 So you might want to check that out if you’re interested in this, but I’m going to kind of give you a little bit of a semination of what he teaches and then also how to apply that to your life as a physician and in trying to lose weight and all of that. Before I get started though I wanted to just share with you how I was laughing with myself about how I’ve been procrastinating recording this podcast. I was like, “Of course, the irony. I’m procrastinating doing the procrastination podcast.” It was so funny. A lot of things have come up and I’ve let a lot of things come up, and I’ve actually learned a ton about procrastination and myself and where I have room to grow because I was procrastinating on this podcast, so thanks. So great. So here’s the first thing you have to understand. The first thing you need to know is that every human being procrastinates, everybody literally everybody. But what’s so interesting about procrastination is that we all have a lot of shame and embarrassment around procrastinating. It’s like we either were taught overtly or kind of picked up along the way somewhere that it’s a character flaw or a really bad habit, like you shouldn’t procrastinate and if you do procrastinate then there’s something wrong with you, or certainly everyone else is better than you because they didn’t procrastinate. And as we know what we end up doing when we procrastinate is we put things off and then we end up rushing at the very end to get it done, and usually the work that we do is actually worse quality than the work we would have done had we just gotten going on it in the first place. So then there’s a lot of shame and embarrassment around that, and then we beat ourselves up because we think that we should have just gotten going on it, and we really just overall think that there’s no good reason to procrastinate, that it really is just bad across the board. So, the problem is that we don’t know yet how to achieve it for a lot of us. Or we’re lacking confidence in our abilities, this is a big one that comes up with weight loss. We think, “Well I would love to do that, I totally want to do that I just don’t know how. Every time in the past I’ve ended up gaining it back, or I’ve failed, or it hasn’t worked, or I haven’t stuck with it.” So we don’t have that confidence that we really can carry it out. Or, I’ve had so many people tell me with weight loss, “Well, I know what I should be doing I’m just not doing it.” And that’s so fascinating too because it’s really not the problem of what to do, you’re just not doing it. It’s like you still are missing some sort of capability or knowledge because the missing piece is the doing it, keeping doing it and keeping yourself doing it, that’s the part that’s missing. Ultimately there’s some element of these every time that we’re procrastinating. If it’s with a book chapter we’re like, “I think I should be able to know how to write a book chapter but I don’t really know how to structure it, or I’m not sure what information to put in.” But we think we should know and then when don’t want to ask. Or we think, “I should be able to just get my charts done,” but maybe we seriously don’t have the capability or knowledge to be able to do it in the sense that maybe we don’t have enough of the dot phrases set up, or the little tips and tricks and templates and things that you can do to make it simpler for you. Maybe you don’t have the knowledge yet or capability on how to setup your schedule properly so that it can support you in being on time. There’s so many things that might be missing. Here’s a prime example. I would love to lose weight but I don’t have my husband on board. I don’t have enough help around the house. I don’t have enough time to focus on it. I don’t know exactly what to do. I don’t have the help that I need. So we see all of these deficiencies and then we usually go into a scarcity of time, and then our brain all it can see is just obstacles. It’s like, “This isn’t going to work, none of it’s going to work, just why are we doing this? Let’s just stay stuck.” But here’s the thing, in order to achieve the goal the only way to move past the procrastination is to grow, and when you’re growing as a person especially in the early stages of it, it can definitely be very uncomfortable. And that’s because you have to use courage to move forward and courage feels bad. If you knew that you could just kill it and get your book chapter written you wouldn’t procrastinate it, you would just get it done. If you totally felt confident and capable of losing the weight then you would just go and do it. There would be no procrastinating happening. So, what you have to understand is that the procrastination is sort of like a magnifying glass on an area in which you need to grow more in order to achieve that goal that you want. This is so interesting, being paralyzed with procrastination as uncomfortable as it is really is a way that we protect ourselves from the perceived discomfort of the growth that’s required ahead of us to achieve the goal. We’re like, “That seems really hard. I don’t know how to do it. I don’t have the help I need. I don’t have time, so I’m just not even going to focus.” It’s like overwhelm. I’ve taught you guys before that overwhelm has nothing to do with how much you actually have to do and everything to do with what’s going on in your brain. And when you’re overwhelmed what do you do? Nothing, right? It’s the same thing with procrastination. When you’re procrastinating you’re like, “I’d rather just stay here stuck rather than moving forward on this task, or doing these things that I don’t know how to do and it’s going to be uncomfortable to do.” It’s very similar to confusion and indecision, they’re all very indulgent, they don’t move you forward toward what you want at all, so important to see that. Then what’s interesting is that there’s often a lot of anxiety or at least a little bit of anxiety that goes along with procrastinating. There’s anxiety because we think that we should know how to do it and someones going to find out that we don’t know. We have some anxiety that we might not be able to achieve the goal. This is a big one with weight loss where it’s like, “Yeah, well I would love to do that but what if I do all of this work and I don’t reach my goal?” That’s of course thinking in a way that’s not going to get you to your goal, but there’s anxiety that is wrapped up within that. So I want you to think about that anxiety as being useful because first of all when you’re feeling that anxiety it right away helps you to identify exactly where you need to develop and where you have room for growth in order to achieve your goal. If I were to decide to do an in person event and I was thinking about what I would do for a talk, and I felt very nervous and anxious about getting up and doing that then that would be a great spotlight for me to look and say, “Okay look, I need to develop my skills in putting together presentation better.” So, that’s actually something that’s going to be happening here in the next couple months. I realized my procrastination and I am taking steps toward moving forward with that, so I guess I can just spill the beans a little bit on this podcast and let you know just to keep your ears open because my plan is sometime in 2019 to be doing an in person event, just with me and you, and I can’t wait. Make sure you hit subscribe to this podcast so that you don’t miss an episode and you don’t miss out on your opportunity. Okay, anyway. I didn’t expect to actually share that with you today, but why not? When you’re procrastinating it really is the definition of being stuck because what happens is your brain basically like shuts down. So what I mean by that is that you don’t have access to your existing confidence and capabilities. You feel less confident than you normally do, and it’s like … I was thinking about when you’re writing a book chapter and it’s just all of a sudden you’re like, “I can’t even write a sentence that makes sense.” It’s like all of your current capabilities they’re just out the window, you can’t access any of that, you can’t access any of your creativity to come up with any new solutions and move you into a solutions focus mind. And you also can’t access the capabilities or resources of the other people that are around you that could potentially help you. So you’re just completely stuck, blocked off, you just can’t do it. And so, you really can’t learn anything when you’re paralyzed in procrastination. What the procrastination does is it cuts you off from why you even wanted the goal in the first place. Then you’re feeling super unmotivated. And then when we procrastinate we tend to isolate ourselves so we’re unmotivated, we can’t access any of our amazing skills and we don’t even remember why we wanted to do the goal in the first place, and then we don’t ask for help, we think something is definitely wrong with us and then we don’t want to be exposed, we don’t want to be found out because we think we’re the only ones who really have this problem, except everybody procrastinates. All of this just compounds the discomfort that’s involved with procrastination. We’re eating ourselves up for procrastinating, not getting our work don, when you do get the work done then you’re beating yourself up because you know you could have done better work if you hadn’t been procrastinating so long, it’s just a recipe for tons of negative self talk. So, kind of like what I was just explaining about doing an in person event. I can speak and I’ve done it before but then I would just go back to, “Oh, but I’m just not really sure, I don’t feel like I have that confidence or capability yet so I’m going to learn.” And then I made a promise to myself, “Well, if you’re going to learn then you’ve gotta do an in person event. And it’s going to be awesome. I don’t know what it’s going to be yet but I guarantee it’s going to be awesome. So then you ask ask yourself why. Why am I procrastinating this? And you’re doing this the same way that you evaluate your thoughts when you do a thought download, so you’re not judging yourself negatively or harshly, you’re just looking at it with awareness, with curiosity, and with interest. I wonder, why am I even doing this task? So you can ask yourself this. Why am I procrastinating here? But then you say, why am I doing this task? Seriously, why? Because you might be like, I don’t know, someone else should do it. Boom. Procrastination done, delegate off to somebody else. Seriously. But you might be like, well because I’m the only one who can lose weight, because I want to get healthier, because I don’t like how my body feels, because my knees are hurting and my back hurts, and my clothes are too tight, and I want to feel different in my body. I want to have more energy. You’re reconnecting with why you’re doing this in the first place. If you’re asking, why am I writing this book chapter? It might not be because you really want to but because it’s something that’s expected of you and your chairperson asked you to do it. Okay, that’s why you’re doing this task. Then the next question is, what is the new challenge here? And this is really important too because oftentimes we’re not able to see it even as a challenge we’re just seeing the negative, that there’s some sort of flaw, or something that we’re missing, or we already should know this. Instead you’re looking at it like, okay there’s opportunity for growth, what is it? What is the challenge here? What am I bumping up against that I don’t have the capability or confidence to do? And then asking yourself, how do I need to grow? And then the final question is, what’s the big payoff for me in doing this? And that’s really important too because if you don’t even know, if you’re not even connected to the purpose of the goal, the point of the goal it’s going to be hard for you to stay motivated to do it. You need to know why you want to do it. The big payoff in losing weight is having freedom around food, not having this weight problem anymore, being able to tackle something else. The big payoff of getting your charts done and staying on time and leaving the office without having to chart at night is getting to bed on time, being able to spend quality time with your family or your friends, actually having some time for hobbies or doing something fun, or maybe actually going out on dates, and prioritizing yourself for some self care sometimes. So, those are big payoffs when you’re really connected to those that also helps you to get out of that procrastination. First of all you understand that you’re procrastinating, then you know you’re reconnected to why you’re doing it, what the new challenge is for you, how you need to grow to overcome that challenge, and what the payoff will be for you at the end. So, once you ask yourself why and once you do this work then you’re no longer procrastinating because procrastinating means that you are not doing anything. Then you’re out of procrastination because you’re taking action to move your forward. You write down the reasons you’re procrastinating and then what you have to do is decide that they’re intelligent and make complete sense. Because it’s just as crazy to think that they’re unintelligent and make no sense but that’s what we do. “This is so stupid, I should just sit down and do it.” But maybe you aren’t capable of doing that yet, and maybe it’s an intelligent thing. Maybe this is just a signal that I have some work to do here. So once you’ve identified the procrastination then you know that the way that you’re approaching that task, or that goal is suboptimal, and that apparently you shouldn’t be doing it because you don’t have the appropriate way of approaching it setup for yourself yet. Then you have the chance to think it through and choose a different way of approaching it. So, when you recognize that you’re procrastinating it helps you decide also if what you’re procrastinating on is even a top priority or if it’s something that you want to kind of put on the back burner, or something that you just don’t want to do, altogether, or somebody else can do it, so that’s really good. We often think, “I should be able to do this. I’m not doing it, and I just don’t feel like it today.” Recognizing, problem solved. For real you guys know that I have a person that comes and does our laundry now. If you’re always procrastinating the laundry care.com, find someone to come in the house and handle that for you, it’s the best money you could ever spend trust me. Then you no longer have to procrastinate it, it’s just not a big deal. Sometimes you might have 25 things that you’re procrastinating and you can’t tackle them all at once so you pick a couple that are top priority and you put the rest on the back burner. But ultimately procrastination is just a sign that there’s an area where you need to grow and it’s an opportunity to progress and grow within that area. Once you recognize the procrastination, you’re telling yourself the truth, and then you’re much more focused. You’re moving forward and the tasks ahead become so much more simple and straightforward because you are back to accessing your capabilities and your confidence, and you’re back to being able to think in a creative way, and think about how others might be able to help you. I think one of the most amazing things that Dan Sullivan talks about is how he recognized that he never procrastinates when he is working with somebody else. And so, if there’s ever anything that he is thinking that he doesn’t really want to do or he finds himself procrastinating he just brings somebody from his team in, or his wife, or whoever, somebody to come in to work with him on something and then he doesn’t procrastinate it. It’s so fascinating. So I was just thinking about that in terms of writing a book chapter. So if you’re sitting there thinking, this is so hard, maybe you have a friend or a colleague or even someone below you, a resident or a fellow that would be willing to give you 30 minutes or an hour of their time to sit down and outline it out, talk it out a little bit, actually work on it, because then you’re not procrastinating. Then you’re actually taking steps forward. Or if it comes down to your charting and you’re trying to get your day more organized so that you’re not running so far behind and having to work late into the night, then you can bring whoever your support staff is, if it’s a medical assistant or a nurse or whoever, in on it. Like, “This is what I’m trying to do. This is how you could really help me and support me. I’d love for us to collaborate on this figuring out a way for me to achieve this goal that I have.” I think that this is so brilliant, so helpful. With weight loss you’re thinking, “Okay well, I need some help.” I mean hello, join my group. That’s the best way to do it. So you’re not procrastinating, you’re like, “Okay, I’ve decided I’m doing this, this is what I’m doing.” And then you’re moving forward with that. Now if that’s not a possibility for you for whatever reason then you come up with some other plan, maybe you bring a friend in, you’re doing it together, or you come up with some sort of system where you’re talking with your spouse, or your partner, or whoever and giving a check in on how you’re doing, it’s so much harder to procrastinate when you’ve got someone else involved, so something to think about. Overall this is really just a new way of approaching procrastination, and what I want to suggest to you I think this is such a magnificent way of thinking about it, is every evening or you could do this in the morning too if that’s better for you, but every evening write down the top three things that you’ve been procrastinating. So, you haven’t been wanting to declutter the house, you’ve been procrastinating getting your charts done and getting all caught up and inbox zero, and you’ve been procrastinating figuring out your food plan for the week. Then, you know what those top three things are, then those become your top priorities for the next day or if you do it in the morning then for that day. So those become your top priorities. So for decluttering maybe you take one drawer and you clean it out, now you’re not procrastinating, now you’re moving forward. So when you’re kind of thinking, “What am I going to do today, or what are the things I need to focus on?” What you’re procrastinating on becomes your to-do list. Now sometimes we have these really big tasks or projects that we’re procrastinating on, and what you can do then is just break it down into smaller chunks like I was saying with decluttering. You do one drawer, or half of a closet, or you just take the recycling out. Break the boxes, the empty Amazon boxes down and take them out of the house, and put them in the recycle bin. You just do one thing that moves you forward on that. When it comes to weight loss you create a plan, maybe you actually insta cart some groceries so you have some good food in the house. There’s some steps you take to move yourself forward. If it comes down to your charting for the day getting done on time you come up with a plan on how you’re going to get it done. My husband was actually just telling me again the other day he got really behind for whatever reasons and I think he said he had like 25 charts or something that he had to do, 20 charts. And he looked at the time, it was already late and he was like, “You know what, 30 minutes. I’m going to give myself 30 minutes to bang these charts out.” And boom, he got ’em done. So what is your plan? How are you going to approach that? How are you going to not like, “I need to go and get a snack. Maybe I need some coffee. I’m just going to do these other things. I’m going to straighten my desk,” instead of actually getting your charting done. This is what you’re going to do and then you just do it, and that’s how you’re going to get yourself out of that procrastination paralization and instead moving forward on all these things that are so important to you. So I can’t wait for you to give this a try and let me know what you think. All right, you guys have a wonderful week and I will talk to you very soon. Buh-bye.